One does not have to look far to find an article about the declining historical knowledge of American students or a poll which exposes citizens’ widespread ignorance of basic history or civics. On the other hand, almost everyone seems to be familiar with a quotation or two about the importance of history (“Those who don’t know history…”). We seem to know that the study of history needs rescuing, that the importance of history must be justified to a new generation. At St. Jerome, we also think that the study of history is essential. In fact, the history cycle which is part of our humanities core class is the backbone of our change to a classical model. Beginning in kindergarten, each grade focuses on a segment of history, cycling through the timeline twice in grades K-8. Our history division (below) is inspired by the St. Jerome Educational Plan (of St. Jerome School in Hyattsville, MD). 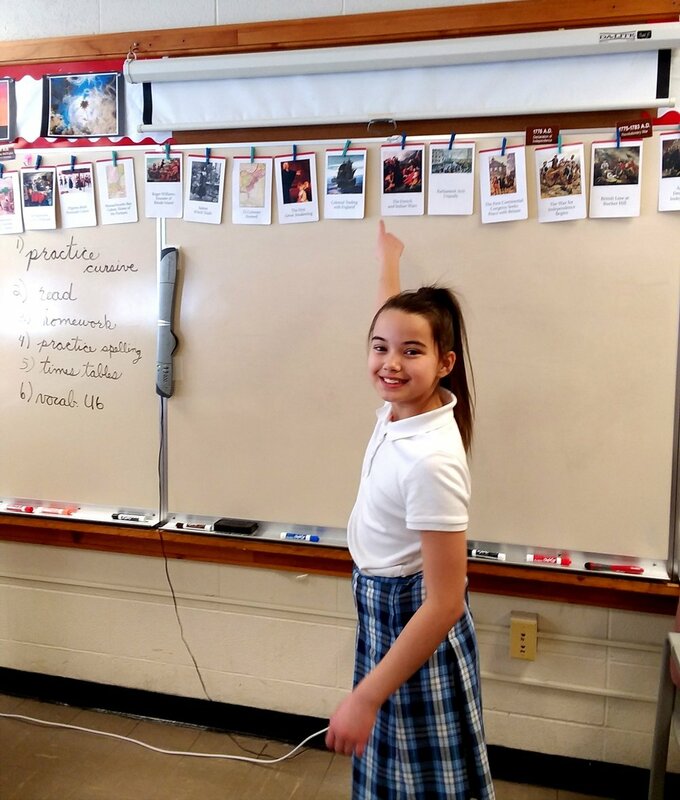 A fifth-grader shows off a timeline of American history. This chronological cycle by grade means that the study of history unifies and links our grades in a coherent progression. Furthermore, each grade is able to bring its time-period to life by studying literature, art, and religion related to it. Many classes have also been memorizing a timeline of their grade’s historical period—usually put to a catchy song or chant—so that they have a framework in which to file further historical learning. Once the timeline is memorized, further historical knowledge is more easily acquired because students have “hooks” on which to hang new facts. With the historical focus of each grade level, St. Jerome’s emphasis on history is readily apparent. We look to the past to illuminate the present and help us navigate the future. Stay tuned for next week’s post where we will explore our approach to history. Bauer, Susan Wise and Jessie Wise. The Well-Trained Mind: A Guide to Classical Education at Home (New York: Books and Sheep, Inc., 2016), 135-136.